With developments in technology and user inclinations, smartphones have become an indispensable part of lives now. Keep reading about create an app without coding. For companies, having a presence only with websites is not considered sufficient anymore, because online activities get more and more mobile every day. Nowadays, the smartphone usage has become quite widespread, and these devices are now among the important channels to reach the customers with. This is true for small and medium enterprises too, as much as it is for the big companies. Most companies still are of the opinion that having a mobile app is a quite costly and complicated action to take. In truth, it is possible to make mobile apps without coding. Thanks to MobiRoller, all the hurdles on this road are removed. MobiRoller, which enables you to have your mobile app without coding knowledge, makes the task easier with the ease of use and privileged features it provides. So how can you have a mobile app without knowing any coding and what are the particulars to consider when making an app? First off, it is a good idea to decide on what kind of a mobile app you want. To this end, you can start with looking at the other mobile apps in similar categories. The mobile apps that are already in use can be a guide for you on both design and features, and therefore help you with shaping your own app. How to decide on the model of income? When creating your app without any coding knowledge, you should also decide on your model of income. Definition of the way you will earn an income through your app is highly important for creation and marketing of the app. For example, you may publish your app as a paid product on the Google Play Store or the App Store and can earn money per download. Or, you can earn it by displaying ads on the app. You may find more detailed information on the subject in our article called ‘A guide to earning money through the ads in your mobile app‘. 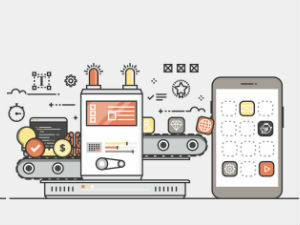 You can place the products and services you will present to the mobile users in your app easily with the help of MobiRoller’s content modules. This way, you may upload PDF documents on your app, include custom forms, or highlight the rich media elements you may need for the promotion of your company with a photo gallery. Making and publishing your own mobile app without any coding knowledge is quite easy with app makers such the MobiRoller. If your company still don’t have a mobile app, you can create one in minutes with MobiRoller. Create your MobiRoller account now and claim your place in the mobile world without delay.